At Cube Automation we can design your packaging line and provide you a “turn-key” solution to wrap, seal, box, code, weigh and stock … your products. In partnership with several of the leading packaging & labeling equipment providers, Cube will source the optimum solution for your Packaging & Labeling requirements. We also design automated solutions for the weighing and coding of your products. If you need a traceability system or a weigh and reject conveyor, we can provide you manual to full automated packaging lines with computer monitoring and products database. 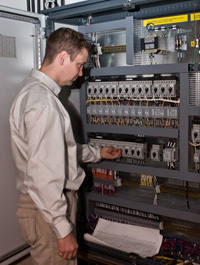 Need a Control Panel to control your conveyors? As a certified designer and manufacturer of control panels, Cube’s “in-house” design team can help you optimize your packaging & conveyor control.